OK, Lana and I went to Va De Vi tonight in Walnut Creek and it was pretty good. They serve tapas which I love because I like to eat small portions of foods but we ordered I think 6 plates. Va De Vi evidently means “It’s all about wine” in Spain’s Catalan language and we saw more wine poured than I have seen in a restaurant in a long time. Lana and I did “flights” which I haven’t done before where you get to sample three wines which was pretty fun. We got a cheese plate for dessert and one of them was the “stinky cheese” which was way overpowering but compared to the other cheeses at least it stood for something. 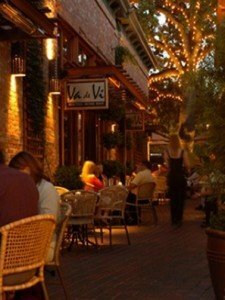 If you are in Walnut Creek I would definitely recommend it for a light meal and I was surpised at the relaxed atmosphere and it wasn’t too loud which is always nice. After dinner we walked around for a little while and I got Freakonomics from Barnes and Noble which I have been wanting to read for a long time. The ice cream shop closed at 7pm due to the holiday so I wasn’t able to get my favorite ice cream but I’ll live. We brought grandma back In-N-Out because Tyler was running a temperature so she hadn’t eaten. It was a really nice night.